An early literacy component for young children is vocabulary, or knowing the meanings of words. Babies and young children take in everything they see and often need firsthand experience to learn how words and language work together. One of the ways we help facilitate this is through talking with our children throughout the day. The more we talk to them and add new words, we help them understand the world they live in and the more they get to interact with language and build their vocabulary. Another way we can help young children grow their vocabulary is through books. Repetition can be a great way to start – children love hearing books read to them again and again. When reading their favorite book, talking about the pictures on the page, asking questions like, “What do you see?” or asking about specific words helps engage children with what they’re reading. 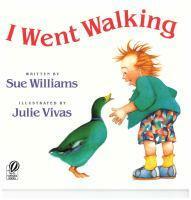 A great book for this is “I Went Walking” by Sue Williams. This book has repetition built into the book, and it discusses color and different animals, both of which provide great opportunities for asking detail questions. 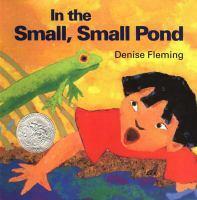 Denise Fleming’s book, “In the Small, Small Pond,” is another great choice for introducing animals that children might not have seen before and also introducing descriptive adjectives. The animals are described specifically – a fish is not called a fish, it’s called a minnow. A bird is not called a bird, it’s called a goose. If a word is unfamiliar, don’t replace it with a familiar word. This is a great opportunity to explain a new word. For example, a child might say, “Bird!” when they see a picture, which is great! To help them expand this idea further, include a more specific word by saying, “Yes, it is a bird. This bird is called a goose.” This helps increase their vocabulary and understand more about the world around them. The more words that children are exposed to and understand, the easier it will be when they begin to learn to read. They will have a larger vocabulary to pull from as they begin to sound out words and a better chance at comprehending what it is they’re reading. The more we talk and read to our children, the more prepared they will be when they begin to learn to read. Do you have a favorite picture book that uses some wonderful vocabulary words? Leave your comment below!